First and foremost, this will be written as non biased as I best I know how. There are some areas of concern for local guides and anglers happening on many of the rivers we all love and fish. My best intention is to shed some light on the issue and that a serious discussion ensues with a possible resolution that we can all live with. This may involve many individuals, local parties, businesses and the Department of Natural Resources to find a resolution. I promise not to name names or point out anyone individually – they know who they are. I strongly believe that many of you know where my passion lies: with the rivers and denizens of these ecosystems, not ever wishing to do any harm or demonstrate reckless behavior. Hex 2016- The Season of High Water. A few weeks ago, on a night of fishing a rather lackluster Drake Hatch on the lower Camp Chicago stretch, a Hyde drifter coasted up behind us, asked what side to pass as we were patiently waiting for our feeder to show himself. We said right, he complied and slid along our starboard side as silently as the night. We exchanged fishing reports. The Take-out was surprisingly pleasant. Mind you, it was early in the season. There were only a half dozen trailers in the lot and I was only boat #3 in the waiting line. Funny part was, I knew both boats in front of me. They were from the Petoskey/Harbor Springs area. I chatted with the guys in the Hyde while waiting for the Au Sable long boat to secure and put away gear. They were as disappointed as we were about the short feeding window and our ever early anticipation of the big bugs, but happy the bulk of the massive hatch had yet to happen. Flats, waiting for the big bugs. The next day, out of the blue, I received a text from an unknown number asking me if I had floated the South Branch. I pondered my response. A) none of your business, B) No, we put in at Townline, C) I have before and it has never been an issue. The concerned guide from the local fly shop informed me that the South Branch is too dangerous with all the downed trees near the confluence, and with a high profile boat with oars sticking out I would scare all the fish. He continued that, of course, it’s not illegal, just highly frowned upon by local guides because it should be for long boats only. This would include the Holy Waters and the North Branch. He also made the comparison that it is not illegal to take a 20 foot Bass Boat with a 90hp twin Mercury motor up from Connors Flats, not that it is fair or right, but totally legal. Especially when the the water is so low. I can’t recall time, except maybe back in the eighties, that the rivers and lakes have looked so good and high. Not the point. I disregarded the memo and continued about cleaning my boat and prepping for the next night on the water. Late June and early July, phone is ringing, client’s special requests and booking dates through the next month is crazy- a good problem to have. The next week, I called to arrange my car spot, my clients wanted a little bit of late afternoon fishing before we set up for evening Hexin’ so I thought Stephan down to Connors would give them a little dry fly early evening action, besides, I often meet clients at Gates so they can buy a few flies/tippet, hat or bug spray. After half the day had gone by and no word from my spotter, I got concerned, so I texted him again regarding my shuttle arrangement. He finally replied that the car spotters have arranged with local fly shops not to shuttle any drift boats in the Holy Waters, South Branch and North Branch. This was due to the many complaints from property owners who don’t appreciate the riffraff from drift boats that come down the river and have a party every night. Hmmm, I am perplexed. For the most part, I am not a ‘Partier’, and the South Branch? The entire thing? Wasn’t that a gift from George Mason, hence the Mason Tract, deeded to the State, to the people of Michigan, to never be developed, but always be enjoyed by the many anglers who wish to fish it?? I understand when water levels are low there are a couple of rocks to look out for, but you have to be aware of those no matter what water craft you float. 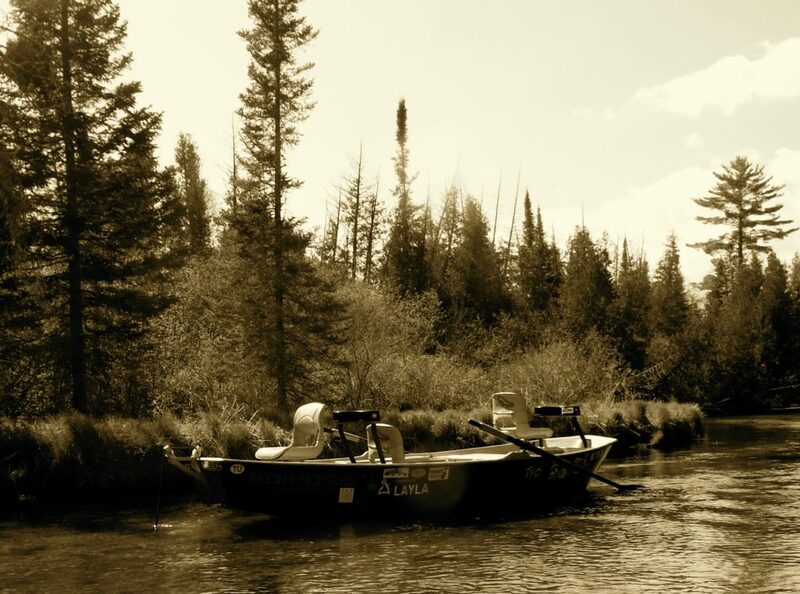 Many guides on the Au Sable learned the trade from Rusty, and he from his mentors. Famous guides whose names will long be in the sands of this Holy Water. Names like Regan, Madsen, Roberts, Smock, Lively and Borcher all had set a precedent that drift boats have no place on the Holy Waters. Even though this was passed down from Rusty, all respect and admiration aside, he did not own the river either. It belongs to all of us. My boat, specifically, did not exist in Michigan 15 years ago when such ideals were being instilled. Partly the reason why I chose the Adipose. The Skiff design is not high profile with banging metal FishRite raucous. Besides the fact that I regularly float the Jordan, at least a third the size of any stretch of the Holy Waters or South Branch, none of my clients ever have felt that I was not in complete control or that their safety was in jeopardy on those waters. Exclusion of drift boats, except during streamer season, (when exactly is that?) 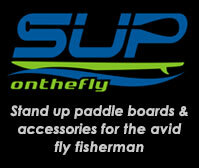 only further makes the prestigious sport of Fly Fishing the Au Sable more exclusive. Only if you have a long boat or guide for Gates Lodge/OAFS/Fullers can you float the Holy Waters/South/North Branch. Wait, you can access these waters with an inflatable craft such as a river tech Confluence/Smithfly inflatable boat. Apparently those boats don’t spook fish or disrupt habitat- especially if you are lodging at one of the resorts. Basically, the water is reserved solely for the guides of the lodge, thereby pushing all the rest of the hex hungry drift anglers below Wakely and into Connors Flats. Long boat of the Au Sable. Let’s look at the difference in the boat. Adipose measures 15’4″ with a gunnel height of 17″ and beam is 74″. 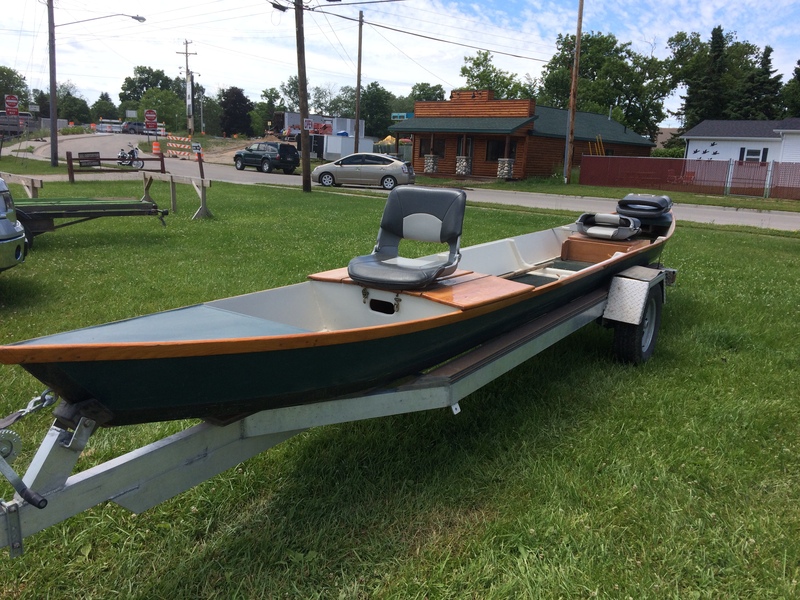 My Grumman canoe measures 17′ with a 40″ beam and 15″ height. Long boats average 22′ with a 36-40″ beam and less than a foot gunnel height. They are much more slender, sleek and attractive. I totally get it, but any of these floating over a trout will spook the fish, not to mention the 100’s of canoes that float the river just prior to any guides launch. I have floated the North Branch in my canoe, it is certainly a shallow water trout fishery. 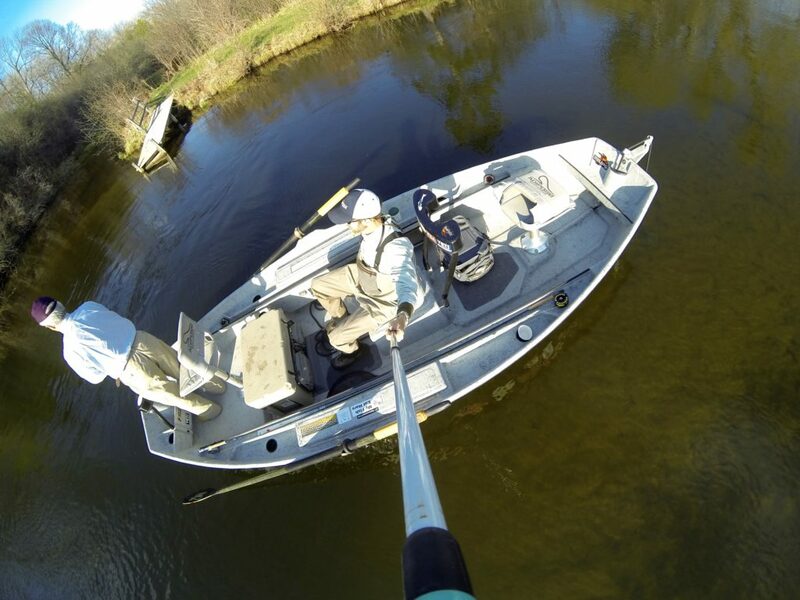 Long boats often use a pole or beaver tail paddle to silently glide into position on a fish, and a quality guide can put you on a feeding fish without their knowledge, but others drag chains and rip habitat while they slowly float down stream. I have fished out of a few classic river boats, my cousins have them, and I appreciate the craftsmanship and design. They were originally made to transport gear and food to logger camps along the river. They were easily poled upstream because of the slender design and shallow draft. Perhaps there were a few anglers and locals who scoffed at the fact some people were actually using these ‘work’ boats for pleasure in the late 1890-1900’s. I was not around, but could only guess they were not readily accepted as fishing crafts. Even if I owned a fleet of Au Sable Long boats, it is a matter of being told that I can’t float a certain section of water when by every right, I have the privilege to guide others on such waters. If I have a client who is from Ohio and he wishes to float past the Famous Barbless Hook so he can see the stone where TU got its start (along with the recent remodel), I should be able to fulfill that request. The romance of the long boat is not lost on me, I vividly recall organizing the TU 50th anniversary meeting in Traverse City. 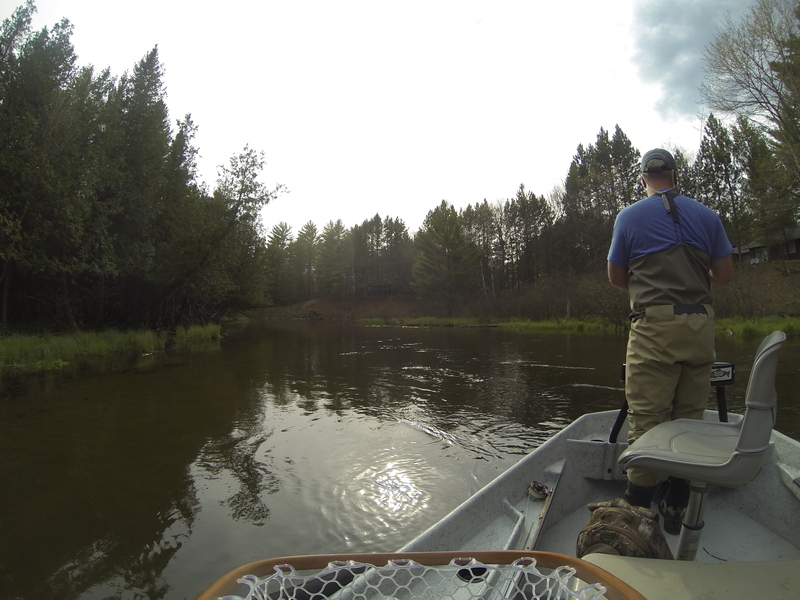 I was to pair up anglers with guides for their ‘Day on the Water’~ the majority requested a long boat float down the Holy Waters, on a hot late summer day, I chose to float my guest down the Upper Manistee, and we enjoyed a boat free river all afternoon. It is something else as a guide to consider, you are on one of the Best Trout Streams not only in Michigan, but the Midwest. Trying to figure out a float any day of the week can be a matter of figuring where the least amount of traffic is to improve your client’s chances of hooking a fantastic fish. Lessons I have learned from my three decades of working the service industry, because really, that is what you are doing, have helped me in many professional situations. Rule #1- You are ALWAYS on stage. Be aware of what you say and how you carry yourself. This is a direct reflection of how well you will treat your guests. Last summer- hopper hungry and meeting clients at local fly shop to pick up a few Charlie Boys and Chubby Chernobyl Ants, I see a fellow guide on the back deck looking over his scheduling book. Wow- why the hostility? Do you have to be such a Richard Cranium? Sorry, I said I would not mention names. My clients were right behind me. After we were in the truck, they asked who was that? I would not tell them, perhaps he was having a bad day, nonetheless, you leave that at home. Rule #2 Always Be professional- this carries on from the first rule, being aware of what you say and within earshot of the relatively small tight knit fly guide world. My clients were enjoying lunch at the other fly shop prior to meeting for a day on the river. The table next to them was not saying nice things about me and my guiding skill set. No offense, I have a good base of first timers that actually like to hear about river history and macro invertebrates, not every client is out to catch the biggest fish of their life on their first trip. I am not on the inside of the “Au Sable Guides Association” nor will I ever be. I have had to work very hard every season to make a success of True North Trout, and to support my family. Some shop guides take for granted all the little things I have to put together for every trip. Lunch, car spot, gas, insurance, flies, rods, boat we all have the basics covered. The independent versus a shop guide is huge- I do all my own river intel, weather watching, make my lunch, keeping it fresh and unique, tie and order flies, line, tippet, etc. It would be nice when I broke a rod if I could get one on loan from the shop or call ahead to have a couple dozen Missing Link Caddis set aside, or lunch pre-made with a bag of ice and sodas. Many of these luxuries are taken for granted until you do all your own PR, printing business cards, website/domain maintenance, donating trips to TU chapters and other non-profits, writing a blog, social media updates, T-shirts, booking trips, answering half a dozen messages after a full day on the river and feeling out what clients are actually looking for besides a ‘Fun day on the River’, then to go home and try to maintain a sense of family. Perhaps the answer is as obvious as the Pere Marquette. When the popularity of the river users exceeds the best potential natural & serene experience, you may need to regulate how many boats are permitted to float per day. Maybe there needs to be a regulated number of guides who pay a premium for a Holy Waters/South Branch access, much like the PM. Then you can legally form a “Au Sable Guides Association” and continue to make or follow rules that were formed in the century prior to your birth. Maybe there could be a Fraternity we could all pledge and there could be hazing and late night campfire bonding rituals involving keg stands, consuming raw meats and waddling around a gymnasium wearing only a jock strap and pinching a marshmallow between your cheeks, forcing pledge to eat said marshmallow when it falls and begin over again. Good thing I am far too old and would never pass any such ridiculous tests of my river knowledge and guiding ability, but it is good fodder. Maybe, hear me out, what we really need is less exclusivity and more unity. Not division among guides, there are many more pressing issues at hand, like New Zealand Mud snails, large boats with motors powering up from Connors and eroding shoreline, Fish Farm/Hatchery, and a host of invasive species knocking on the door of the best trout river in the Midwest. **Footnote from my wife, who only reads and hears the stories: Seriously? Aren’t you all adults? First, you’re fishing with clients and a boat pulls up alongside you and PISSES in the water. The very river they claim to love and are willing to fight you for. Are you kidding me? Then, out of nowhere, when you are home with your family, the barrage of annoying and seriously immature text messages start from a ‘guide’ at Gates who has personally taken it upon himself to start a manhunt for you and your ‘rig.’ He has discouraged all car spots from working with you, and he is talking smack about you at the shop to your CLIENTS. Grow up already. You’re worse than hairdressers and old ladies. Koz has worked his whole life toward this passion and he deserves every client that calls. He treats them like royalty, he loves the sport, and he takes care of the waters every chance he gets. Last time I checked, no one owned the river. So, redirect your angst and jealousy and try to put some of that energy toward something positive. Having fished these rivers my whole life, I have always tried to spend my days afield for the sole purpose of refreshing myself in nature. To spend time with friends who appreciate the same things that I do, or alone, in the midst of an environment that is completely different from where I live, has, and always will be the main reason why I fish these rivers. Early in my fishing experiences I shied away from the streams that you would see boat traffic, and you would seldom see boats of any kind even on rivers that you see many on today. I never seen an Au Sable riverboat on the North Branch for over twenty years of fishing beginning in 1966, and the first one that I did see wasn’t owned by a guide but a personally owned one. While Hex fishing the South Branch in that same period I NEVER seen a guide in that same period. There seemed to be an understanding that during periods of intense river use by wading fishermen such as when the Hex was going that the guides didn’t want to disturb those fishermen merely by their presence, and respected their efforts to find a “spot” on the river without being disturbed by a boat passing by. It’s not that way today. There is a different mindset among guides and boat owners in general that ignores the principals of yesteryear when common respect for others was the norm, and not the exception. The very things that I mentioned at the outset of this post that I look to experience while fishing is becoming just about impossible to arrive at because of this shift in thinking, and the basic reason for most of this is caused by the driving force of money being made, and the base thinking that “I’m going to get mine”. I really don’t see how this is going to change for the better down the road because the people that have so much invested and are making a living off the rivers are being driven by this”force” and can’t back off. I will continue to fish, but I know that it’ll never be the same again unless everyone could re-kindle the respect for others, that was years ago the rule rather than the exception, but I strongly suspect that that isn’t about to happen. All great points, thank you for contributing. I doubt it will ever be as good as it was in ’96, but we can try to work together instead of working to separate anglers, guides and recreational river users.